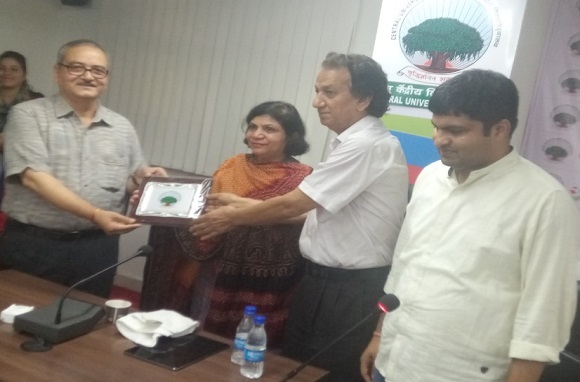 The Centre for Comparative Religions and Civilizations Central University of Jammu organized a lecture under the series “Know Your Country and its Culture” by Prof. Neerja A Gupta from Gujarat University Ahmedabad on the theme “Contribution of Indian Literature to the World Thought” Prof. Govind Singh, Dean Faculty of Social Sciences and humanities presided over the event. Mr. Ajay Kumar Singh introduced the speaker and Prof. Zaffar presented the welcome address. Dr. Murugesan Arumugam presented the vote of thanks. After the lecture there was a lively and vibrant discussion. Prof. Govind Singh in his presidential remarks praised and thanked the speaker for her thought provoking and informative lecture.